At GaelicPerformance, we have been working along with Transition Year Students for nearly 10 years. During this time, students that worked with us have won many awards and accolades for business in every county in Ireland. 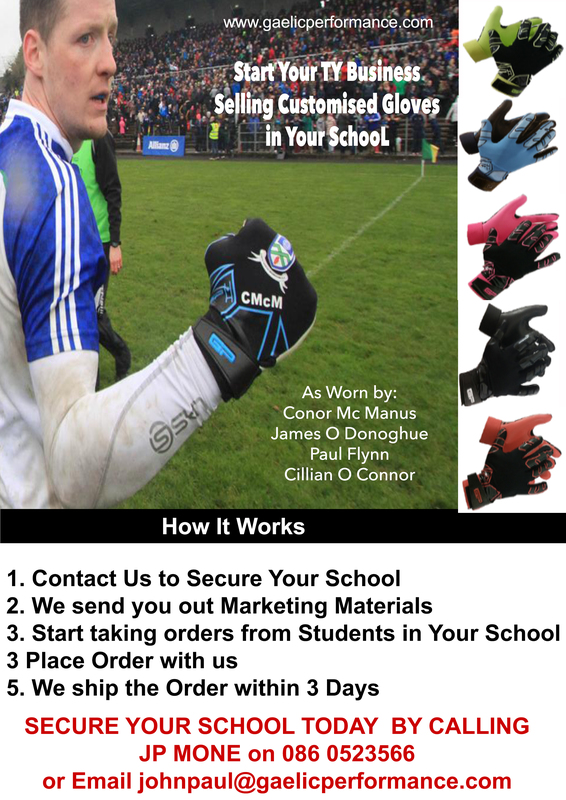 By teaming up with GaelicPerformance, you can offer your school mates the opportunity to purchase Gaelic Gloves with their own club crest, or school crest or what ever you choose. The great thing is that we keep the risk on your end to a minimum. We do not work with minimum orders, and we get your gloves out to you within 5 working days, unlike other companies that take 5 weeks. While we do the work on the back end, you will do the majority of the work " on the business end", and in the process learn many skills that are fundamental to business success. Things like Market Validation, Sales and Cash Flow Projections, Negoiation, Basic Profit and loss, Organisation Skills, Follow through, Delegation, Graphic Design, Marketing, and Sales. In addition to this, we are more than happy to help you with any business related questions you have, and we have even created a workbook that students can use to help then ensure success for their mini company.